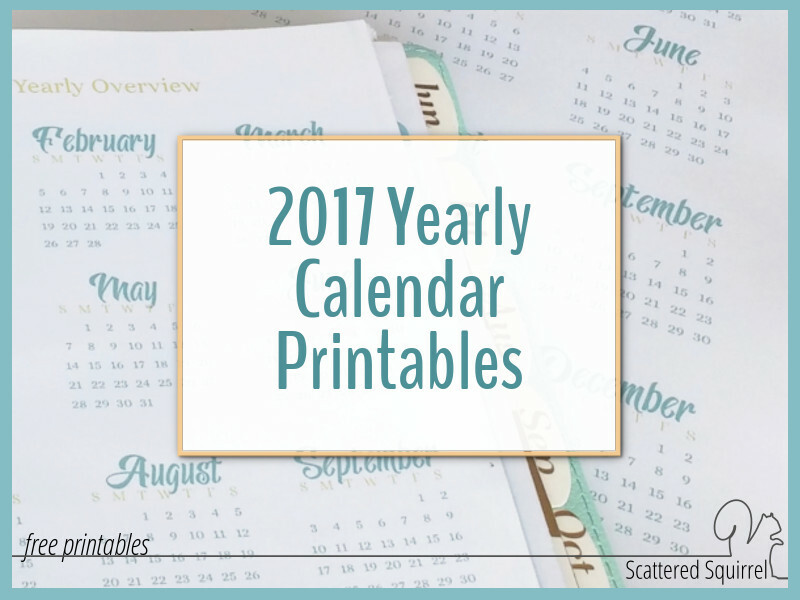 2017 Yearly Calendar Printables are Here! 2017 Yearly Calendar Printables are Here!!!! Wowzers! 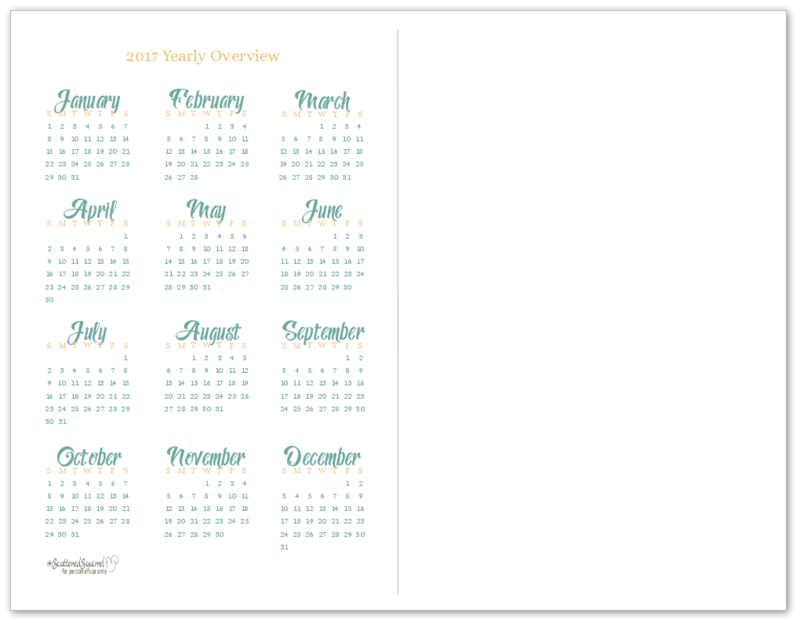 I can’t believe that the 2017 yearly calendar printables are all ready to go! Let me tell you, the 2017 calendars did not come together as smoothly as previous years calendars have. In my infinite wisdom I thought I’d try using a different program to design them and let’s just say that if I had caved after the first 2 weeks, these would have been done 4 weeks sooner. My stubborn nature reared its ugly head and I was bound and determined to make it work – and I did!!!! Until I went to export as PDF anyway. (insert unimpressed face here) In the end, I went back to the program I know and love and I’m happy to say that – they’re here!!!! Just like in previous years, I’ll be releasing these in stages. If you follow me on Instagram or Facebook then you may have already seen that I’ve started work on the full-size 2017 calendars. They are getting close to being done. I’m aiming for Thursday, which may mean Friday, but for sure they’ll be ready by the weekend. The half-size ones are in the works as well. If those are the ones you’re waiting for, you won’t have to wait too long. I’m planning on having those ready to go up here next Tuesday. Now that the housekeeping stuff is taken care of, who’d like a peek at the new calendars? I look forward to making the new calendars every year. I love getting to play with different colours, test drive different font, and generally, just have some fun. For the 2017 calendars, I opted to use two colours and keep things simple and bring in pops of fun with the fonts. Above is the full-size yearly overview. This gives the best impression of what I was going for with these calendars. Simple, but fun and pretty too! I made sure to leave lots of margin around all the months so that you can add in notes if you need too. Here we have the half-size 2017 yearly calendar. In previous years, I’ve stretched the half-size yearly overview over two pages. Last year, many of you asked if I could do it on a single page, so I thought I would give this a try this year. I have one printed off in my new planner, and I’m undecided whether I like it on one page or not. I’m curious to hear what you think. If you liked the old way, let me know and I’ll see about adding one to the mix. Like all the printables here on Scattered Squirrel, if you’d like a copy for yourself simply click the pic of the one or ones you would like and the PDF version will open in your browser and you can decide to save or print right from there. I’m so sorry that today’s post is rather short. I’m not really sure what else to say about these, I think I may have already rambled too much as is. I would love to hear your thoughts on the new theme for the 2017 calendars. And please do let me know your thoughts on whether you think the single or double page would work best for the half-size yearly calendars. I’m really torn on this one. Linking up at these great link parties. Thank you so much for these ! You are the best ! You are very welcome Lina, I hope you enjoy them. Thank you so much for lovely 2017 calendar! You are very welcome Dhitaree. I hope you enjoy them. Thank you for printables. I really prefer the the half-size yearly overview over two pages. Hi Thea, I’m working on that. I’m hoping to have it out by the end of June. I find I prefer it on two pages as well. I work for a University and we will be having our library party for the incoming freshman and I was wondering if there’s anyway possible that you would have the 2017 monthly calendar up anytime soon. I printed the 2016 I just need the 2017. My plan is to have a few on display for how to be organized and all the ways a student can use the calendar . I’m willing to pay a small fee for the calendar. Hi Megan, I’m happy to hear that you like the calendars. Thank you so much for your kind words. I try really hard to balance the practical needs of a planner with making it pretty too, without it needing to use a lot of ink to print it. I’m happy to hear you think I’ve done that well. I love your half-size planner printable’ s. They are very convenience for me to keep track of everything I need to do. I wold like to see the 2017 calendar’s in the half-size format. Thanks for all the hard work you do on all your printable’s. Hi Nancy, thank you for taking time to leave such a nice comment. The planner pages to match the 2017 calendars will be available later on this year. I’ll probably start posting them in November, but they are coming. Thank you for the beautiful 2017 Calendar! Do you have one for 2016 as well? Hi Melissa, thank you so much. I do have 2016 ones too. You can find them on the dated calendars page. 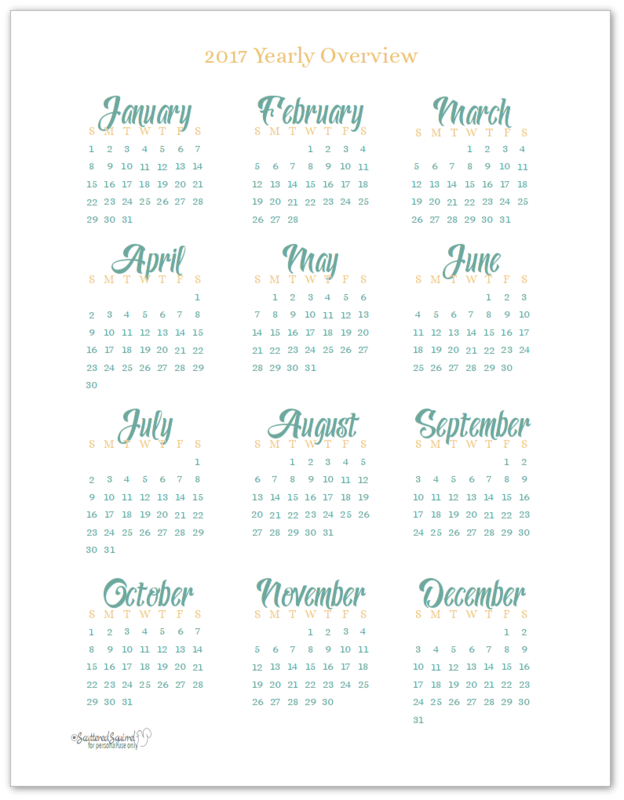 Just click the Printables tab on the top and then click the picture that says Dated Calendars and it’ll take to where they are. THANK YOU!! The half size yearly calendar is exactly what I was looking to add to my calendar. I love the colors. Oh I’m so happy to hear that Sharon. I hope you enjoy it! Hi Liesl, yes I did. You can find them on the Home and Life Organized page. I hope that helps. How do I download them?? Hi Alin, to download any of the printables simply click the pictures of the ones you want. The PDF files will open for you and you’ll be able to save and download them. You mentioned in June that you were going to create a 2 half-page 2017 year calendar. But I can’t find it… am I blind or just in too much of a hurry to see it? Hi Andra, oh, thank you for the reminder. I guess I forgot to share it. I’ll see about getting that shared ASAP. Thanks so much! This is just what I was looking for. 🙂 Very cute! I’m happy to hear that Lisa. Thank you so much for our kind words. I’m so glad you like them Cathy. I hope you enjoy using them. Hi Alli! These printables are so nice! Thank you so much from Japan! Hey!! This is perfect 🙂 I was wondering if you will have the same option for 2018?? I would love a matching one for this coming year!! Thanks so much for your printables!